This week at KARA you’ll find the guys and gals outside with a Fun In The Sun theme! 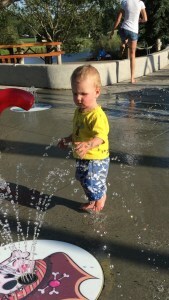 My little bears love being outdoors and have tremendous fun at spray parks. Cleaning and organizing are what I love to do with my kids and they are young and impressionable enough that they think it’s fun! We put some good, dancing music on, usually a Shania Twain album, and just let loose! If cleaning, I prep some extra spray bottles of water for my two boys while mine is a combination of water and vinegar. This way, if they pick mine up and spray each other, the worst that happens is that they start to smell like a salad. Next, I give each of them a scrubby pad and a baby wash cloth. My older Grizzly Bear actually has a fair few muscles now and can actually see the difference when making something clean. We wash floors and mirrors together, after making silly mirror faces of course. My little Polar Bear makes some developmental progress while feeling the different textures of the cloths. The smooth, soft baby cloth versus the rough, bumpy scrubby brush really enthrals him, plus add a bit of water and watch out! When organizing, I bring my kids into the room that we will be working in and close the door. Clothes, books and long lost forgotten toys move too quickly in the hands of my children and my pulse quickens when watching them cart around dozens of escaping LEGO blocks. I usually only invite my kids to help organize my own room or theirs. They love organizing mommy’s closet and putting on my shoes! When we organize their rooms, I bring down the boxes of toys lingering at the tops of closets. By storing some toys away, it allows me to rotate their toys so old ones become new again, saving a buck, and outdated toys can be sold, making a buck. There are a few things I’ve learned along the way when it comes to soliciting my children’s help in daily chores, however. Pushing buttons on the laundry machines, using the feather duster, and sweeping dog hair under the rug is all good fun but I’ve learned some areas are just not meant to be cleaned by kids. The dishwasher has led to a few close calls as my little ones are just too little. Likewise, the cleaning of the bathroom isn’t meant for curious little bears. It’s icky enough to clean a toilet as an adult with proper sanitary routines. Add a kid and… well I just don’t want to think about it. doing arts and crafts, reading to them, taking them to programs, teaching them good manners, and the multitude of other tasks we do for our loved ones add up quick. This is just one way of combining a few tasks together to try and make it easier on yourself as a busy parent. But hopefully our families’ summer continues to be sunny, and if not, at least our houses will be clean!